IKA Works is the world leader in the design and manufacture of high shear mixers and systems. IKA produces a full range of mixers, from laboratory to production scale.Our high shear mixers feature our proven rotor- stator designs that are used in thousands of chemical,food, pharmaceutical and cosmetic companies. The machines are designed to withstand the most demanding applications, and provide ultimate flexibility for your application needs. 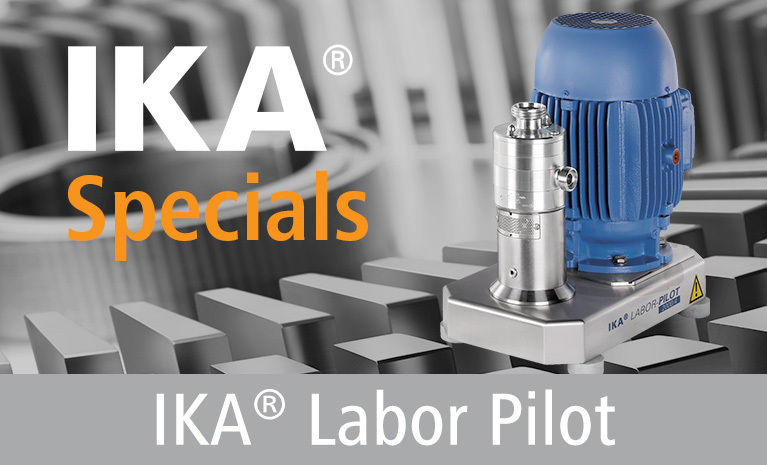 IKA’s mixers can be used in both in- line or batch operations by re- circulating. There are many rotor- stator choices available to fit any application requirement. In addition, IKA mixers are available in one, two, and three stages, providing maximum flexibility when selecting a machine for your application. All IKA machines can be Cleaned In Place (CIP) or Steamed In Place (SIP), and all contact metals are constructed of 316 stainless steel. Rotor- stator technology and high shear mixing: Mixers that utilize a rotor and a stationary stator typically operate at considerably high rotational speeds that produce high rotor tip speeds. The differential speed between the rotor and the stator imparts extremely high shear and turbulent energy in the gap between the rotor and stator. Therefore, the tip speed is a very important factor when considering the amount of shear input into the product. The equation that represents the tip speed is: Tip speed: V = p Dn (m / s) where D = Diameter of rotor (m), and n = rotational speed of rotor (rev / sec) Additionally, the gap distance between the rotor and the stator will contribute to the amount of shear. 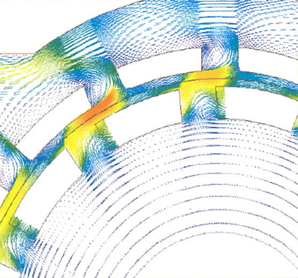 The equation that is used for calculating the shear in the gap between rotor and stator is: Shear rate: t = V/ g (s – 1) where V = Tip speed of rotor (m / s), and g = gap distance (m) Another important factor is the shear frequency, or the number of occurrences that rotor and stator openings mesh. Computational Fluid Dynamics (CFD) is used to analyze what happens when this occurs, as shown in the picture on the right. 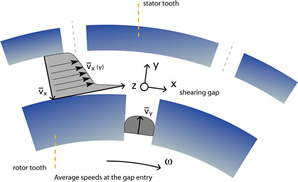 The shear frequency is given by: Shear frequency: f s = N r N s n This can be combined with shear rate to determine the shear number: Shear number: S = f s t When considering rotor- stator designs, there may be multiple rows of teeth, and the shear number must be applied for each row.